This promo recipe from French’s was clipped from a newspaper and found in a large collection, date unknown. I’ve typed it below along with a scanned copy. Combine giblets and neck with water, onion, celery, and salt in saucepan. Simmer, covered, 30 minutes. Measure and save 3 cups broth. Pour pan drippings from turkey into large measuring cup; let stand a few minutes to separate fat from juices. Return 1/4 cup fat to pan. Discard remaining fat, but save juices. Add the 3 cups broth and meat juices to pan. Combine flour with cold water until smooth. Add to pan. Cook and stir until thickened. Season with salt, pepper, and nutmeg. 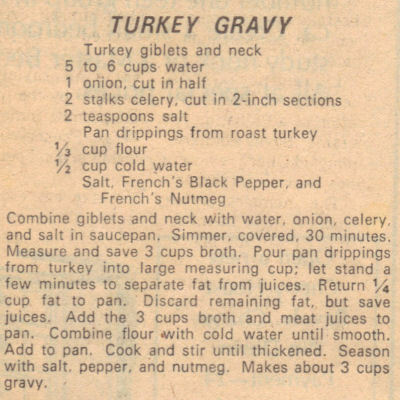 Makes about 3 cups gravy.